Tenements in the Five Points were made from wood and brick. The wooden structures measured about twenty to twenty five feet wide and twenty five to thirty feet deep, and stood two and a half stories high at most. These buildings were originally intended for artisans and shopkeepers businesses, and were meant to house their families and perhaps a few employees. By the 1850s, most of these "shops" had been carved into small apartments with space for a shop or saloon on the ground floor. This setup is still typical in the buildings that line Mott and Pell Streets today, as shopkeepers run their businesses from tiny, cramped facilities on the ground floors of densely packed short-storied buildings that seem to run into each other. According to the census, the typical two-room dwelling held on average "only" five people per apartment. Yet 46 percent of these apartments housed six or more people, and one in six accommodated eight or more. With so many people per apartment, and so many buildings per lot, the population density of the Sixth Ward in the 1850s (310.4 per acre) exceeded that of any other district in the city. With the possible exception of one or two sections of London, antebellum Five Points was the most densely populated neighborhood in the world (2001: 75). In most of the apartments only one room had access to outside air, and the inner rooms were always dark and practically unventilated. As often as not pressure was inadequate to carry water above the street floor. In winter the toilets, sink traps and water pipes, which were outside the building, froze solid (1958: 55). 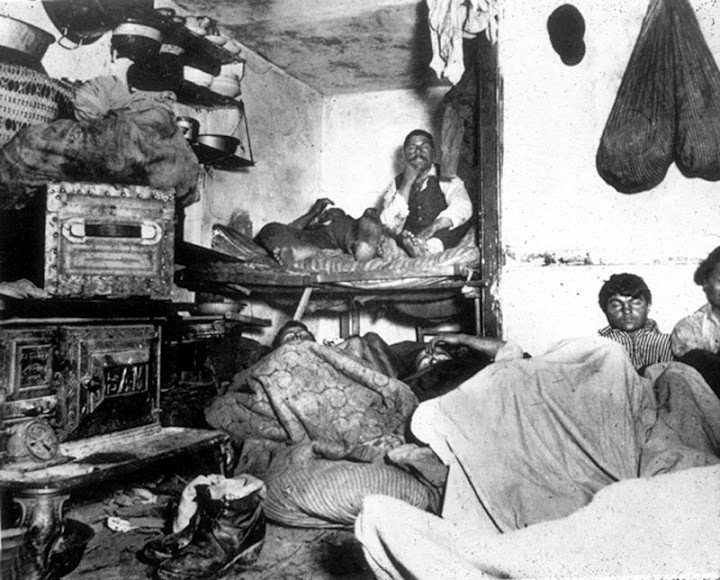 It has long been the opinion of historians—and journalist and reformer Jacob Riis—that capitalist greed was to blame for deplorable living conditions of the Five Points. However, economist Michael Montgomery (2003) proposes that even though government was lauded for its efforts to clear the slums, building regulations in New York City actually contributed to their persistence, which is what created the market conditions allowing the slums to endure well into the 20th century. Yes, it's true that landlords tried to maximize profits by packing in as many structures as they could on their plots, and minimized expenses by performing the barest of repairs. However, it's worth noting that construction and management of the tenements was really a "mom and pop" operation—funds were limited and owners could not afford to purchase multiple lots, so they tried to maximize the return on their investment. 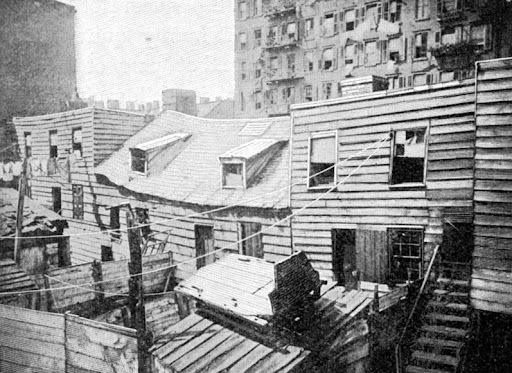 Montgomery argues that the regulation that passed in 1811 stipulating that lot sizes could not exceed 25 by 100 feet severely hampered building opportunities because it encouraged the building of small, elongated structures where central rooms would have had limited access to light and air—key features of the tenement structure. As this regulation applied to all of the city, it may surprise you to know that many wealthy residents lived in buildings with similar structures. The difference was that the wealthier residents lived on better streets, did not overcrowd buildings, demanded higher quality construction, and had better amenities (e.g., running water) (Montgomery 2003: 500). This was also noted by Bremner who indicates that in the 1860s, housing for "moderately well-to-do" families had no better provisions for light and actually had less attention paid to fire safety (1958: 56). Montgomery argues that if the city had eased height restrictions, taller buildings would have alleviated some of the demand for housing. In conjunction with the height restrictions, laws mandating changes to tenement house construction made newer tenements more expensive to build, which priced out lower income individuals from access to these buildings. The result was that older style tenements were even more crowded! This includes a cash-based economy, a dearth of documentation and credit histories that are needed for government or charitable assistance, and many middle-aged workers with a limited command of English. The image he paints echoes of a neighborhood that existed almost 200 years ago, when immigrants packed in together to weather hard times and make ends meet. When their "immigrant character" also prevented them from accessing better jobs and city services. The vegetable and fruit carts that lined Mulberry are largely gone. Newsboys no longer hawk papers. Children no longer sell matches or offer to sweep the street for change. 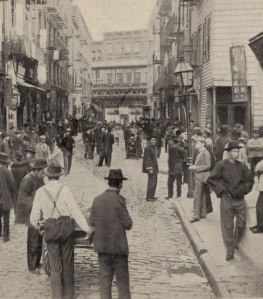 But perhaps as a fitting end to New York City's Immigrant Heritage Week we should ask, is the Five Points really gone or does it linger in the "immigrant character" of today's Chinatown? [Update 5/5/10] I leave you with this video taken in Columbus Park (former Mulberry Bend). Close your eyes and let the sounds transport you back to a time of opium dens and saloons. Apologies in advance for the shakiness of the video in places—and for the number of tourists who pop into view. Read more about the Five Points here. Newfield, Jack (2003). "How the Other Half Still Lives." The Nation. March 17.